Don Briel, founder and longtime director of Catholic Studies at the University of St. Thomas in St. Paul, was diagnosed in mid-January with two forms of acute leukemia. He was told the cancers were untreatable and he had a month to live. Briel said he welcomed the news: That a month was not too short, but not too long to know that oneself is dying. He died Feb. 15 at his home surrounded by his five children and friends. Maria Wiering, editor of The Catholic Spirit and Catholic Studies alumna, interviewed Briel in his home Feb. 8 about his life’s work, the future of Catholic higher education and preparing for death. Briel, 71, retired from St. Thomas in 2014 and held the Blessed John Henry Newman Chair of Liberal Arts at the University of Mary in Bismarck, North Dakota. The interview has been edited for length and clarity. MW: How did you find out you had acute leukemia? DB: I didn’t really have any particular symptoms except for some fatigue, but I had cataract surgery on Dec. 15, and on the follow up check up on Jan. 5, the surgeon noted that there was hemorrhage in the eye and swelling of the optic nerve, and he thought there must be some underlying condition that had caused this. So he sent me to have some blood tests drawn that afternoon, and I had a call on [the following] Monday morning on my way to Mass that there were cancer cells in the blood. So I went to an oncologist that afternoon who said definitely it’s leukemia, but he didn’t think it was acute leukemia. There was a bone marrow biopsy scheduled for later that week, and I got a call back saying yes, indeed, it was acute leukemia. Then I was in the hospital briefly with an infection, and, on [the next] Monday, he had been suggesting there were several treatment options, but then, on Tuesday morning at the hospital, he told me that, in fact, I had a very rare combination of two acute leukemias, which in fact were untreatable, because chemotherapy can target one or the other, but not both. So, in a strange way, I’ve felt a great peace. And when I was told there was no treatment, I felt like I didn’t have to make a decision and it was actually something that was a good thing. God had decided this and I really didn’t have to respond. I was told then [Jan. 16] that I would probably have a month to live. So I felt great peace about this. I had always prayed that I would have some advance knowledge of dying, and my ideal time frame was actually one month. It’s time enough to focus on the reality of death; it’s not too short, and it’s not too long. The thing is, that if I hadn’t had this incidental appointment with this surgeon, I wouldn’t have known, and therefore I wouldn’t have had this knowledge, which I had always prayed for. So there seems to be providence in it, on every aspect of the diagnosis and my experience of it. MW: What have these last few weeks been like? It sounds like the visitors are continuing at a high volume. DB: It’s been a great surprise to me, in some ways, even when I was in the hospital. The fear of death is such a phenomenon in our culture. I remember some years ago reading Ernest Becker’s “The Denial of Death,” and I think this is such a pervasive feature of our time, that people were astonished that this didn’t trouble me, that I wasn’t anxious to get a second opinion or find some new trial that might confront this. And since then, I suppose my anticipation had been that dying would be more of a passion than an action, that it’s something where I would be withdrawing from the activities of life that had shaped my experience as a teacher, all these years, and as a father. Instead, I found that it’s become more active, perhaps [more] than I’ve ever been in my life, that people want to come and to touch their experience of Catholic Studies and the life that it opened to them, and it’s been a great blessing in fact. People ask what I do during this time, and some of them had expected that I would say I’m reading important spiritual texts, and certainly, I do read, but it’s more [a] time of this combination of prayer — an intensification of prayer — and seeing so many former students and colleagues. And I have the great consolation of the care of the Handmaids [of the Heart of Jesus] and the extraordinary grace of having daily Mass in my house. MW: How has seeing so many people with whom you’ve you connected through Catholic Studies caused you to reflect on your life’s work? DB: One knows, generally speaking, both the number and the quality of the students who have come through this program. I had a note recently from Matthew Levering at Mundelein Seminary. He said wherever he travels, he encounters Catholic Studies students, and he’s impressed not only by their lives but [also by] the work they’re doing. But it’s one thing to know that in the abstract, and it’s another to have them come, sometimes after many years, to speak about their lives, to talk about their families, to speak about their priesthood or their religious life, and to share their gratitude for all that had formed them — the transformation of life that Catholic Studies has made possible for them. MW: You are known for being the founder of Catholic Studies. Especially as Catholic Studies at the University of St. Thomas marks its 25th anniversary this year, can you take me back to the founding and the ideas that led to it? DB: My role in it was providential, in the sense of that it was the result of a set of work and readings that had shaped my own life and education, most prominently, of course, the work of [Cardinal] John Henry Newman, whose vision of university education had a profound impact on my vision of what was necessary in our own time, [through] his insistence that the purpose of university was to form the mind and habit of students, which enables them to see things in relation and make judgments about reality. So this was the heart of my vision. When I came to St. Thomas I was teaching in the theology department. I had done my doctoral work in Strasbourg [France] focusing on Newman. For some years I had been the chair of the theology department, and we had attempted a number of innovative programs, including Perspectives, which was attempting to weave courses in theology with philosophy and English. The hope was that if you were reading an English text, and you were reading a theological work, and you’re reading philosophy, you’d have some sense of how they impact one another and what their rightly-ordered relation would be. What we found is that this was very difficult to sustain, partly because of the reward structures of the university, so there wasn’t an ability simply to modify the current curriculum. So that led me to pose the creation of a new program, an interdisciplinary program, which would bring together a group of faculty and students to seek to create the conditions for this education, which would provide this integrated habit of mind in students. It was controversial because it was new. Universities were increasingly specialized and increasingly based on disciplinary competence. To achieve this habit of mind [sought with Catholic Studies], it’s not simply enough to have this academic program, but also to create formation programs which invite students into a kind of bond of communion from which deep friendships might emerge. It was an attempt to form the whole life, not just to form the mind. And for Newman, he thought this was very important. He thought this couldn’t just happen without a close personal relationship between professors and students, and also a residential experience, which we could not create in the St. Paul campus, but which is one of the motivations which led me to develop the program in Rome. MW: Why Cardinal Newman? What about him intrigued you? DB: The thing that first struck me about Newman was his important theological work in “An Essay on the Development of Christian Doctrine,” in which he examines the question of history: How can truths change in order to remain the same? So often today we think that change is a corruption of an idea, but for Newman, time is important, not simply accidental, so that Christianity as an idea, or any living idea, must keep expanding and find new ways of articulating its deepest convictions in order to remain true to itself. So here’s a man who is orthodox in the most creative ways — not just a sort of antiquarianism or conservatism, a kind of holding on to the past — but seeing the way in which a living idea can both retain its essential character and also respond to the changing conditions of history. So that’s the theological side. Of course, he also wrote a very important essay on the relationship between authority and freedom, the “Letter to the Duke of Norfolk,” in which he reflects on the nature of papal infallibility and its relationship to freedom, and a series of other works. But he was just a great creature. T.S. Elliot said he was the greatest homilist in the English language. So there was this great complexity about him, a comprehensiveness of his vision. He wrote one of the two great spiritual autobiographies in history, with Augustine’s “Confessions” — the “Apologia Pro Vita Sua” — and he wrote very important philosophical works as well. And he was a poet. I liked the comprehensiveness. He was often called the father of the Second Vatican Council. He prepared the way for the 20th century’s insights about these many questions — how truth can change but remain the same, the role of the papacy in relation to the Church as a whole — and from that point of view, he was just still a great living mind for me. MW: Catholic Studies grew quite a bit beyond an academic major — three institutes, annual lectures. What was it like for you to oversee that vision? Why was it important for it to grow just beyond an academic program in a center? 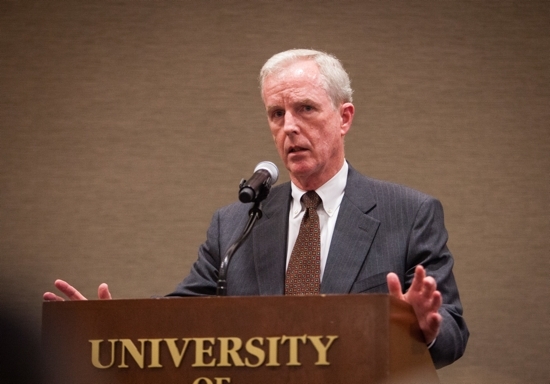 DB: I had hoped that Catholic Studies would be a catalyst for the university as a whole, and not just an academic program for students, but a forum which would invite faculty and staff into a sustained reflection on the Catholic identity and mission of the university as a whole. And so we developed institutes which promoted interdisciplinary reflection and programming. We developed lecture series [and] faculty development programs, in which faculty could come together to think aloud for a week, focusing on a set of common texts. So we really wanted to make this a true center for the university and not simply an academic program among others for students. MW: You’ve seen Catholic Studies catch on throughout the country, even at public institutions. What do you think attracts other universities to Catholic Studies? And what’s the future of the Catholic Studies movement? DB: On the one hand, I think there is a growing recognition that the reduction of university education to merely a technical education and certain narrow competence in a particular professional field leaves unexamined the larger purposes of human life — the ability to form judgments, to form the habit of mind, to see things properly and their true relation. I think there is a growing recognition that the university is in a state of crisis, and that something more is required. This is true, of course, of all universities, whether secular or religious. And so, I think there’s a sense that we need to find something that would provide this opportunity for a more humanistic and purposeful vision of what education is for, [one that asks] what are its deepest purposes. From the Catholic point of view, of course, we confront the fact that over 90 percent of Catholics in this country in universities are in secular institutions, not in Catholic ones. The old understanding had been that if you have a Newman Center attached to a secular campus, you could provide this sort of pastoral and sacramental formation on the side of the intellectual formation of the larger campus. But I think today the secularization of culture has gone so far that that it’s no longer sufficient on its own — that you need an intellectual formation really oriented to these deepest goods that will complement the technical training students are getting on the secular campus. So I expect this to continue to grow. I’ve been involved in a number of new programs around the country, most directly University of Mary’s affiliation with Arizona State University, but also the work at the University of Nebraska, the Newman Institute for Catholic Thought and Culture there, and I expect this to continue to grow. MW: What do you think is the future of Catholic higher education? DB: The prediction is that a very considerable number of middle to small Catholic universities will close. There are several reasons for this. Some of them are financial. It’s simply not a sustainable model, I think, to presume that universities can survive, particularly if they don’t have a very distinctive identity that would distinguish them from alternatives which are far less expensive. I think there has been a struggle, and I have been engaged in this for many years now, about what the deepest purposes of a Catholic university are, what is distinctive about it. In “Ex Corde Ecclesiae,” St. John Paul II had described what he thought to be the essence of Catholic university teaching, but the fact of the matter is that many Catholic universities simply emulated their secular counterparts in moving toward this utilitarian, pragmatic, technical education that is educating students for success or specialized competence. As I’ve mentioned before, the deep crisis that emerges from this model is that if students don’t have some deeper sense of the larger purposes of life and of education, they simply become technocrats incapable of contributing to the common good for which all of life is made, and without that deeper sense of the religious foundation of human experience, the absence of which Mr. [Christopher] Dawson said would always produce one form of totalitarianism or another. MW: What do you see as the essence of Catholic Studies? DB: Former students who come to me now say that Catholic Studies opened their lives to the possibility of a joyful freedom. They sensed a new possibility, their life wasn’t simply about some sort of technical routine. There was the joy — “gaudium in veritate” — that Augustine described at the heart of the university which gave them this great freedom. And so I think it has this conversion [aspect]. From time to time, when there were openings, we would have students from other universities in the [Rome semester] program from Yale, Williams, Dartmouth, Notre Dame. Almost all these students would say that the deepest friendships of their undergraduate experience were to be found in that one semester, and it was because students shared not just common interests, but they shared the deepest foundations of their lives. They were seeking to grow in wisdom and to order their lives to the truth. And this is what I think is one of the more remarkable things about Catholic Studies: the felt bonds of communion that link one another and the friendships that it has produced — friendships which are enduring across time and across space. MW: How does that make you feel, knowing that? DB: This is not my work, it’s not our work, it’s God’s work, and to have been given this possibility to assist in realizing this great educational vision has been the great privilege of my life. MW: What has given you the greatest joy in your university roles? DB: Well I think at the heart of my vision of my own work is that of an educator or a teacher. The administrative work became essential. It wouldn’t have been my choice or my sense of myself. But I’m deeply impressed by Newman’s sense that each of us has a vocation in life: We may not know it in this life, but we’ll know within the next. And this means not simply that we set out to accomplish something or to do something, but that we have to be attentive to the graces which come to us, which invite us to take on a work which we would never have anticipated or understood. And so for me, Catholic Studies, from the very beginning, was this sense of a vocation given to me, not something I set out to do or to accomplish. And then I realized it would take certain forms that I wouldn’t really have desired or searched for: the administrative side of it, the fundraising side of it, the public relations side of it, the national and international dimensions of it. I had always thought of myself essentially as a classroom teacher. And yet the demands of this grew, and I began to see that I had a vocation to it. MW: But you were able to teach Newman from time to time. DB: Yes, that’s right. And that was a great joy to be able to share my love of Newman with students, who responded in really remarkable ways to that over the years. MW: Do you feel like you have fulfilled that purpose that God created you for? DB: I’m very pleased with the legacy I see in the lives of students who sometimes come up to me on planes and airports and at events and express their gratitude, and in an overwhelming way over these last weeks have done so. The one element that I would have liked to have developed further is this role of Catholic Studies and secular campuses, because I think it is necessarily the future for the Church’s relationship with higher education. But I think that will move forward. There are others who can take up that work. I have to say that I look forward to death, not with a sense a great success, but a sense of the privilege, again, of having been invited into the work that has had these remarkable results. MW: You mentioned that in the hospital you encountered a nurse who knew you were a theologian, and she was surprised at how you handled your diagnosis. She asked how you as a theologian approached death. What did you tell her? DB: She had a bad experience of a theology course as an undergraduate, and she moved from one institution to the next, and she just wanted to know what the point of theology was and whether it explained anything about what she saw to be the serenity of my response to this diagnosis. But this [inquiry] was true not simply from one nurse, but from a physician who was treating my infection as well. Again I’m struck by the fact that I think so many people are fearful. John Paul II said the 20th century will be remembered not so much for its bloodiness, which was catastrophic, but for fear. And I think so many people are fearful of death largely because they don’t have any sense that there is anything other than the immediacy of the material world. And for me, as for any Christian, of course, our confidence is not in this world but the world into which we are invited in Christ, and the great hope that gives us in the face of the prospect of death. MW: As Catholics, we talk about this idea of “a good death.” Do you see yourself as experiencing a good death right now, or preparing for one? DB: It’s interesting. I was always struck by the fact that when people speak of a good death today they tend to mean one they’ve chosen. There’s this great emphasis on physician-assisted suicide, for example. When I was studying in Strasbourg, there was a very famous altarpiece in Colmar which was painted as a consolation to the patients who were dying in a hospital. It’s a very stark image of the suffering of Christ. And so when a Christian speaks about a good death, it tends to mean something quite different from what our own culture tends to mean. And yet, ironically, I find myself in a situation of anticipating death with very little physical pain. It’s quite remarkable. But yes, this has been everything I’d hoped for, as I had hoped that I would have roughly a month to prepare for death, and that I could be conscious of it and order my life to that truth. And then I have this enormous consolation in the care provided by the Handmaids, care provided by family, children and grandchildren, and by so many friends who are coming in from around the world and former students as well. And then finally, most astonishingly, it looks as if I will have very little pain as I move toward death, which God must know I am a coward. So it’s more than I could have hoped for. MW: Have you thought of this time of dying as your final lesson in some respect — the final thing you are learning, and also the final thing you are able to teach others? DB: I think so. That has struck me regularly in the course of this. You mentioned the nurse who had come to me and the physician [who had] come to me, and I think we’re all witnesses of the truth to which our lives are ordered. And certainly, the deepest truth is the mystery of life and death. I mentioned that I had assumed that I would be moving into a more passive withdrawal from the immediacy of life’s activities. And now I find in fact that I’m taking on the role of a witness, an active witness, within that final stage of life. So it’s an extension of the teaching I’ve tried to do all my life. MW: You’ve talked about reconnecting with students that you haven’t seen in years. For those whom you haven’t been able to see, what do you want them to know at this time or about your hopes for them and Catholic Studies? DB: I’ve been asked by many former students about what advice I have for them at this stage of life. I would go back to what Newman tells us about this: that God is inviting us to take a role in the plan of salvation. I think the modern problem for Christians is not that they have an exalted sense of their importance, but they don’t have a deep enough sense of their importance. I mean, if this is true that each of us as persons is responsible for the achievement of the plan of salvation, then I hope that Catholic Studies has inspired its students to realize that greatness in the lives they’re leading as well as the work they’re doing. MW: Do you feel like you’ve been given the grace of a special insight into life as you been preparing for death? DB: I don’t think so. I have from my earliest childhood had a deep sense of God’s presence in my life. And I certainly have it now, but not in some new and unique way. God has accompanied every aspect of my experience. Again, go back to Newman who said that we are made in God’s image, and that for him, it was impossible to think of himself without thinking of God and without thinking of himself. That at the heart of this is a relationship. You know we’re not autonomous beings, but we are beings in relation. “Cor ad cor loquitur” was his cardinatial motto: “Heart speaks to heart.” So all of my life I’ve understood myself in this relationship with God. And this is simply another development of that abiding sense. MW: Are there things about death that help to put aspects of life in perspective? DB: I think so, because, on the one hand, you could say that we’re always, at every stage of life, in the process of dying as well as in the process of living. But the more one comes close to the physical reality of death, the more eternity then looms with a kind of immediacy — [it’s] not just an abstraction. And so from that point of view, yes, it has that kind of intensity. MW: Is there anything else you’d like to add? DB: [I once read] that in the end, one’s life will be defined by one of two habits: gratitude or resentment. The work of Catholic Studies — not just for those students who have experienced it, or the faculty who have helped shape it, but in my life in particular — has been a source of great, great gratitude to have been given this gift of helping to form the lives of our students in a way which I think has had, and will continue to have, a tremendous impact in the life of the Church and the life of culture.